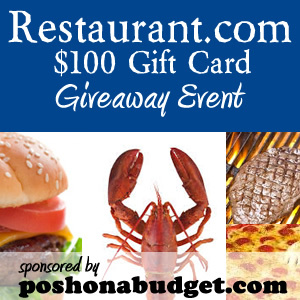 One winner will win a $100 to use at Restaurant.com. Here is a great chance to go to your favorite restaurant and enjoy dinner on us! You can win a gift card to purchase any certificate at Restaurants.com. What a neat thing! You can give it as a gift, you can use it for a special romantic dinner, or maybe to take one of your kids out for a special treat! Disclosure/Disclaimer: This site or any other site associated with this event has in no way been compensated for the preceding information. This giveaway is valid where allowed by law, open to anyone in the United States who is over 18 years of age. One winner will be randomly selected on 5/30/14, notified via email, and will have until 6/2/14 to reply. If there is no reply another winner will be randomly selected. Next post: Easy Food Swaps to Eat Better Today!